Possibly one of the most persecuted animals in history, this majestic and noble creature has suffered a shocking catalogue of violence and abuse over the past two millennia or more. It has been used as a weapon, killed for sport and entertainment, stolen for zoo exhibits, graced the floors and trophy rooms of the unconcerned, been poisoned and electrocuted by villagers protecting their cattle, drowned in open-pit wells and is now, in the face of dwindling tiger numbers, being hunted for body parts for use in Chinese Traditional medicine and other applications. Populations were first dramatically and critically depleted, and in some areas wiped out, in Roman times. Had you lived as a Christian in ancient Rome, you might have wished this had happened a little sooner. For Christians were often hunted as criminals for refusing to worship Roman Gods. And indeed these, the Asiatic lions, were the lions the Christians and other prisoners were “fed to” and the ones gladiators faced in the arenas of the primitive coliseum games of the Roman Empire. Not the lions choice, of course, they just happened to fit the task in hand. And at the time they were as abundant as their human fodder. But there is no doubt the animal’s lives ended very badly. Killing them was a form of highly popular entertainment. They were starved in cages and then brought up into the arena where they would be baited, abused, stabbed and gored by gladiators, to the delight of the crowd. Sometimes, after they had been encouraged to kill a defenceless prisoner tied to a post. “Hunts” would also be organised in the arenas with the lions having no way out and no cover. Attack was their only defence and always ended in the gory and painful deaths of the overwhelmed, trapped lions. Roman emperors staged these contests for personal popularity. Both animals and humans suffered a terrible fate. Those who tormented and killed the weakened and frightened lions were hailed as heroes. Those themselves killed were soon discarded and replaced by others. The death toll was high on all sides. But such deaths meant little to the sadistic Romans. Their appetites were simply whetted further in their insatiable lust for blood and gore. These same callous and depraved Romans undoubtedly started the ball rolling where decimation of certain species are concerned, including the Asiatic lion, by the massacre of multiple species of starving, terrified animals for their own personal gratification. At the inauguration of Titus, in 80AD, eight thousand animals were slaughtered within three days for his and the crowd’s amusement. More of this centuries-lasting, unjustifiable slaughter can be found here, but do be prepared to be shocked at the scale of the annihilation and the range of animals concerned. It is truly disquieting. It is also particularly disturbing to realise a civilisation so advanced in so many ways could be so uncivilised and so deficient in others, including compassion. The slaughter petered out eventually, after having continued for some four hundred years, but not because someone had developed a sense of fair play or a love of animals; simply because most of the animals were sadly gone and the power of the Roman Empire was declining. But, by then the Romans had managed to eradicate the Asiatic lion from most parts of its original habitat. And not just lions were involved in these barbarous activities. There were also elephant, crocodile, ostrich, bear, hippo, leopard, giraffe and rhinoceros, to name but a few of the species concerned. In fact, anything they could capture by means fair or foul, they did, and with undisguised relish. In short, the Romans wreaked complete havoc on the indigenous wildlife of Asia, Africa and the Mediterranean; lands which the Asiatic lion once roamed freely. Some species disappeared altogether. An early pattern certainly seems to have formed here which, though many may now eschew such practices, great numbers have still not evolved from this mentality; indeed it seems firmly embedded in their psyche. Humans continue to be the lion’s only predator and the same blood-lust and cravings for degenerate fun have never been entirely stamped out. Lion hunting for trophies and pleasure continued throughout the centuries, long after the Romans were gone. Wealthy visitors and local tribesmen pursued them for sport. Some native peoples hunted them for meat and others killed them in defence of their own. In the nineteenth century, in India, the only country where they could still be found by this time, British colonial officers were bloated with pride when they were able to take home a lion skin to add to their trophy rooms. One hunter shot over three hundred lions. Something started by one empire running rough-shod over the world was finished by another doing the same, almost two thousand years later – so much for empires! Finally in 1900, following the devastation created by the British, which left the only remaining population confined to one area – the Gir Forest in the state of Gujarat – the lions were afforded legal protection. At that point, this one isolated population consisted of about one hundred lions. Hunting of lions is still forbidden in the Gir Forest and its surrounding areas, and although these particular lions are not subjected to profit-making hunts for tourists, there is still some evidence of recreational hunting. And, inescapably, there are the highly organised gangs of poachers who, despite the endangered status of the lions, continue to profit from them. Provided, naturally, with a huge incentive. A new threat has arisen in the past few years. There exists an enormous trade in tiger body parts using virtually every bit of the animal. As tiger populations have become more depleted and demand has risen, specifically from Hong Kong, South Korea and Taiwan, those who seek bones and other body parts for Traditional Chinese medicines have turned their attentions to lions, with the most at risk being the Asiatic lion. The ever-growing demand for these medicines could potentially wipe out this species altogether. A huge revival in the use of traditional medicines is currently occurring. Demand is high and prices are soaring. Anything containing tiger parts is considered a status symbol. Ergo, anything containing lion parts seems destined to achieve the same repute. If the Chinese peoples, most notably, but not exclusively, the absurd nouveau riche (tuhao), do not develop some respect for wildlife soon, it will only be a matter of time before they have either eaten the planet clean or poached every last available tiger, lion, pangolin, elephant and rhinoceros. All in the name of “traditional” medicine (using animal parts which serve no medicinal purpose whatsoever), in the pursuance of “must-have” items of adornment and by ritual slaughter for entertainment. As with ivory, the tuhao need to learn how to be more responsible and intelligent when using their new-found wealth. Cites restrictions and rules are either not working here or not being applied, rendering them pointless at this juncture. Unless change is effected soon, there will be no wildlife left to protect and cherish. One cannot help but see certain similarities here between the current rising Chinese Dynasties and the long gone Roman Empire. Albeit the use of the animals differs. Since India’s human population in the area surrounding the Gir Forest recently reached over one billion, much conflict between the lions and the natives has arisen. The lions are also vulnerable to unpredicted events because of the nature of their population. Added to which, open-wells across the area have resulted in deaths by drowning as the lions literally fall into the unguarded holes. Crudely erected electric fences also play their part in the mortality rates. An article written in the Scientific American suggests, quite rightly, the Asiatic lion has outgrown its space in the Gir National Park. Relocation discussions began twenty years ago, and still continue as the parties involved scrap over “whose lions are they anyway!” and “will they be safe from the resident tigers in their new home”. Court cases have been brought and plans made, but currently pleas are flying around and any final decisions hang in the balance. After years of litigation it has become clear, the good people of the state of Gujarat are more than a little reluctant to let their lions go, despite the obvious necessity for greater habitat. 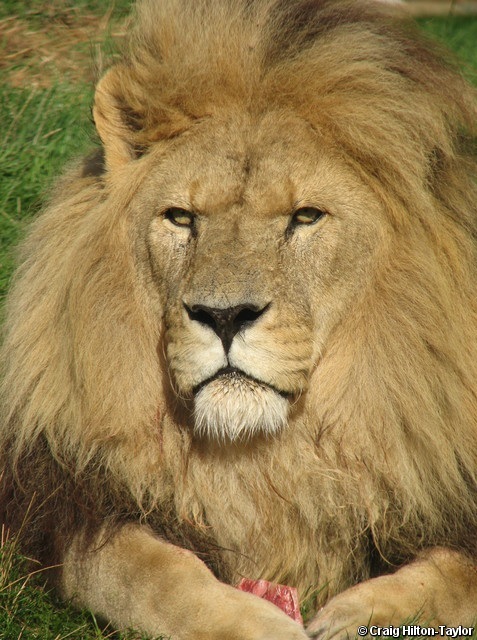 Although smaller than African lions, the overall appearance of the male Asian lion is very similar. The mane is one distinguishing feature. The Asiatic male lion lacks the enormous half-body-covering mane of the African male lion. It’s mane is much shorter and less dense, leaving the ears visible. Other notable features are the fold of skin beneath the belly of the Asiatic lion and the longer tufts of hair on the elbows and the end of the tail. This impressive apex predator can reach a length of eight feet, with a three-foot long tail and weighs over six hundred pounds. On top of this intimidating bulk, the Asiatic lion sports a set of very powerful and retractable claws and long, sharp canine teeth. This is one very ferocious beast that hunts down its prey of deer, antelope and boar with consummate ease. Running up to fifty mph, it pounces on its prey without missing a step. In fact, it is capable of jumping up to thirty-six feet when needs must, so prey on the ground presents no problem. Though despite these skills not every chase ends in a kill. The females are the hunters in the pride whilst the males spend most of their day loafing around. They do, however, get first dibs at the meal and usually the largest share. They are followed by the cubs. The female, for all her hard work, is rewarded with the left-overs. Perhaps this is where the phrase “the lion’s share” comes from. Altogether they are highly social beasts, living in small prides with females mostly hunting as a team, unless the prey is of manageable size for one lion alone. Mating takes place all year round with males and females reaching maturity by the time they are five and four years old respectively. A litter of one to four cubs are usually born after a gestation period of three and a half months. Cubs are born blind and helpless, they weigh a mere two to four pounds and are fully dependant upon their mothers for the first few weeks of the lives. They will suckle to the age of six months but will start eating meat at the age of three months. Whilst male members of the pride will often guard carcasses preventing the lioness from feeding in order to allow the cubs to eat first, males taking over a pride will kill cubs under one year of age. Independence comes at one year. By then the cubs should have their own hunting skills honed. Sadly, there is an eighty per cent mortality rate in cubs and infanticide is the major cause. This is followed by natural causes and occasional parental abandonment. Those who survive infancy and current threats to the species should hopefully live to their full life expectancy of about twenty years. Lions are the second largest of the big cats, after their closest relatives, the tigers. The lion symbol is used as the national animal of many countries, including England. It has also been used for centuries in heraldic emblems on shields and coats-of-arms. Though often commonly and mistakenly referred to as the “king of the jungle”, African lions live on grasslands, savannah and plains. As forest dwellers Asiatic lions are the only ones who come relatively close to this label. Amazingly, the Asiatic lion’s heels don’t touch the ground when it walks and it can issue a roar which can be heard up to five miles away. The Asiatic or Indian Lion is the only extant species of lion outside Africa. Exposed grassy scrubland and dry deciduous forest. 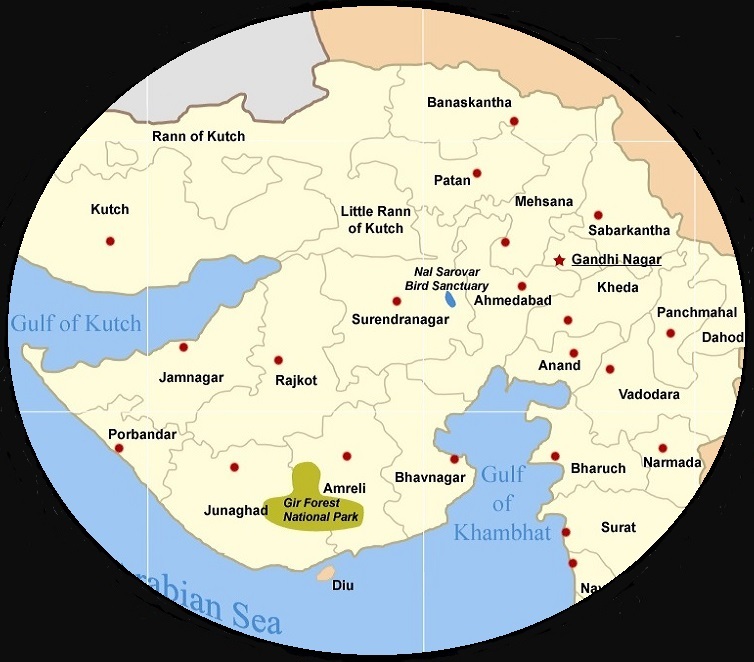 Gir Forest National Park, Western Gujarat, India and the surrounding area. Primarily deer, antelope and wild boar. Forests fires, poisoning, drowning in open-pit wells, inbreeding, disease, loss of habitat and prey, and poaching. These lions are now being targeted for Chinese Traditional medicines as tiger populations decrease. The Asiatic Lion (Panthera leo ssp. persica) is listed on the IUCN Red List of Threatened Species as Endangered. It is also listed in CITES Appendix I and it is fully protected in its native India. A reintroduction programme, the Asiatic Lion Reintroduction Project initiated by the Indian government, serves to restore numbers of the species in the wild by way of reintroduction, increase water holes and end poaching, etc. More details can be found here. Little more than four hundred of the species exist in the wild. Although the population is now stable, poaching has increased putting numbers once more in jeopardy. Various zoos across the world hold Asian lions and some participate in captive breeding programs. A translocation programme to offer a larger prey base is in place, but this is currently being opposed by the Gujarat Government. Global warming – Is it really a myth or an absolute reality? Is it part of the natural climatic cycle or a panic situation created by scientists, climate experts, industrialists and meteorologists; aided and abetted by self-serving politicians? This increasingly important issue has been debated for decades – with many conflicting opinions being aired globally, especially by those with a vested interest in delaying any action to address it. But whichever camp you have a foot in, there is no doubt the Arctic ice cap IS receding, and if we don’t do something about it soon, we WILL lose the terrifyingly beautiful polar bears forever. Sixty to one hundred years is the predicted time left for these spectacular animals, and the world will be a lesser place without them. Unusually, the biggest threat to the species is not hunting by humans (although this is a danger which cannot be ignored); it is their loss of habitat that will see them driven to extinction, and human activity is indisputably the primary cause. Currently, and misguidedly in my opinion, they are listed only as vulnerable by the International Union for the Conservation of Nature. These magnificent apex predators are in far deeper trouble than that. As the ice continues to melt, there are many, ever-increasing threats to their survival, including land and water pollution, increased shipping traffic, oil and gas development, an increase in drowning and starvation, and, of course, the ubiquitous hunting parties. Polar bears are completely dependent on the ice packs, where they hunt, breed and build their birthing dens. But the expanses of water they now have to cover to get to them are getting far larger, and although the adult bears are accomplished swimmers, more than half of the cubs drown. There is just too much open water. Some bears have been seen up to two hundred miles from land. Indeed, in 2004, four adult polar bears drowned off the coast of Alaska when trying to reach the pack ice. Mother bears are also reluctant to take young cubs into the water in the spring: the cubs just don’t have enough fat on them to retain the heat levels needed for long periods in the water. It conjures up a deeply sad vision of endearing little polar bears swimming after their mothers, struggling to keep up. Many destined to die of either hypothermia, hunger or exhaustion. Their adoring mothers suffering, too. Each one of them desperately trying to survive in one of the most hostile environments on the planet. And even more anguish and hardship appears to be coming their way. Having just marked the 25th anniversary of the Exxon Valdez Oil Spill (by no means the worst in history), Big Oil remains unrepentant. Notwithstanding oil still clinging to the boulders on the beaches in the Gulf of Alaska, further plans to develop offshore oil and gas in the Arctic are still being seriously considered. As more ice melts, more potential sites are created for exploration and drilling. Ergo, less ice means more scope. This particular effect of global warming has not gone unnoticed by the industrial mega-giants. However, current research indicates even the smallest oil spill now has the potential to destroy the entire ecosystem. And how do you clean up an oil spill in floating, fragmented ice? Or any ice at all, for that matter! No-one, it seems, has yet found an effective way. The reality is; the polar bears will die, along with the seals (their prey species), many whales and countless birds, and untold numbers of fish eggs will again be destroyed. In fact, virtually all marine life in the area will be either affected or obliterated as well as those who feed on them. The best estimates for casualties of the Exxon Valdez spill were: 250,000 sea-birds, 2,800 sea otters, 300 harbour seals, 250 bald eagles, up to 22 killer whales, and billions of salmon and herring eggs. In short, another oil spill, or pipeline leak, would spell complete disaster for the polar bears and other wildlife. Now is the time to close down all fossil fuel exploration in Arctic waters. If not, it WILL be too late to save this extremely vulnerable, rapidly declining species. In order to survive extreme conditions, polar bears must regulate their own body temperature. An oil-drenched coat would prevent this. Their prey species will most certainly end up covered in oil, which the bears may well ingest, making them vulnerable to any contaminants, as would personal grooming. Kidney failure and brain damage are among some of the possible after effects. For those which haven’t already starved to death, an oil spill would most certainly take them down the same road. Observations suggest pregnant polar bears do not react well to disturbance – something they are quite sensitive to. Any disturbance of den sites during exploration could cause the mother to abandon the den and/or her cubs, leaving them to die of hypothermia or starvation. With such a low population growth rate, the polar bears may never recover from these threats. And, of course, there are many other threats, a list of which would not be considered complete without the omnipresent hunters. Decades ago, polar bears were hunted vigorously for their pelts, paws, teeth, meat and fat. 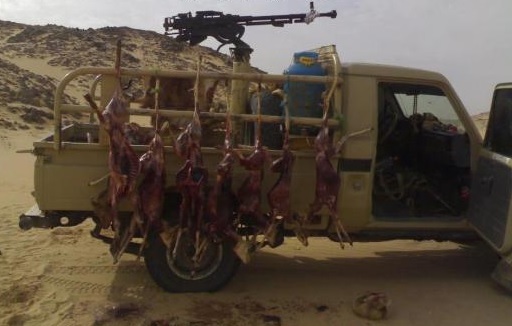 Such hunting was largely unreported, often illegal and highly unsustainable. This supposedly ended in 1973 when Canada, Denmark, Norway, the then USSR, and the United States of America signed an international agreement, known as the Agreement on the Conservation of Polar Bears . Since then, however, four of these countries, Canada more than most (a country which so barbarically still allows the slaughter of baby seals and boasts “Canada is a proven world leader in the management, research, monitoring and conservation of polar bears”), have continued to host polar bear hunts. “Today”, according to Polar Bears International: “Legal hunting in Canada continues on a limited, regulated basis for native peoples”. Really! Perhaps someone should pass this on to the Canadian government, who are currently charging fees for hunting and trophy licences to non-natives, to which they are adding seven per cent tax. Export licences are also issued. The native peoples are now cashing in on this killing spree, over and above subsistence level, and a great many non-native hunters have leapt at the opportunity. In defiance of declining numbers, these polar bear hunts in Canada are regularly advertised for all who care to, and can afford to, kill them for fun. Polar Bear Hunting, one of the many profit-making businesses involved in killing polar bears, tells us, “The actual hunt must be done in the traditional manner with an Inuvialuit Native guide and dog team”. In my unwavering opinion, the “actual hunt” should not take place at all, but since we are travelling that route, let’s not forget the “traditional” high-powered rifles and crossbows used, without fail, on every single hunt. Shameful! Quite frankly, it’s hard to imagine the callous mentality of those who consider curtailing the one-and-only-lifetime of an animal to be a once-in-a-lifetime thrill for themselves. Nevertheless they do and they need to be stopped. This is very far removed from the native peoples’ original subsistence hunting. This is hunting solely for pleasure and profit. With reference to Alan Parker’s superb article – How Coke Can Save 100 Polar Bears Every Year, “Of the five countries who signed the (Polar Bear) agreement, Canada is the only one that still allows the hunting of polar bears by anyone other than native peoples. As such, trophy hunters from around the world flock to Canada, paying about $35,000 each (not including commercial or charter air fare) for the chance to kill a polar bear”. Polar bear pelts, it seems, are fetching up to twelve thousand dollars at auction in Canada, so temptation is high. Unsurprisingly, buyers are mainly from China and the Russian Federation. As a result, hundreds of polar bears are being killed every year where populations have been listed as either declining or data deficient. Each sub-population has its own kill quota, and although, to reiterate, it should not be happening at all, there is no guarantee even this is being adhered to. Norway is the only country that protects polar bears from all forms of hunting. And let’s face it, if you are tracking a polar bear, it’s a pretty big target to miss when you find it. Male bears can weigh anything between seven hundred and twelve hundred pounds. And, at almost nine feet tall and ten feet in length, it doesn’t take an expert marksman to fell the poor bears. In fact, polar bears are the largest of all living bears, next to the Kodiak Bear. It seems to be debatable which bear is actually the bigger one. Curiously, polar bears have black skin covered with thick, hollow, colourless guard hairs. The hairs reflect the light giving the appearance of a white coat. The bears moult in the spring, and, having devoured many seals over the winter period, their coats will have taken on a yellowish appearance. This will be restored to the more familiar “white look” by the summer months. With this dense, water-repellent fur and their heat-retaining, four-and-a-half inch layer of fat, they can withstand extreme temperatures on land and in water. They are also equipped with rough, anti-slip pads on their enormous paws to help them when travelling on ice. The same huge, powerful paws act as paddles in the water. Polar bears have always been carnivores. Until recently that is. Ecologists, most pointedly Linda J. Gormezano of the American Museum of Natural History, have observed them changing their diet and hunting techniques to include other land-based foods. Bird eggs and caribou seem to be their favourites. The bears have been seen appearing during the breeding season, strolling nonchalantly up to the nests and helping themselves. Other, more determined bears, have scaled cliffs to access the eggs. Some have even been observed eating grasses and berries. Many more sightings on land have been reported in recent times and bears have often been known to approach human settlements. One theory being an increase in population, with the bears merely spreading out. The more realistic reason is the ice is melting and quite naturally bringing them closer to human-occupied land where they are now spending more time. More polar bears on land does not indicate a population increase, more a sign of altered migration habits as the bears, facing starvation, are forced ashore through lack of ice and prey. Polar bears are solitary creatures and tend to team up only during mating and cub rearing. There is a gestation period of about eight months, after which the female will give birth to up to four cubs – twins being the most common – each weighing about one pound and reaching a mere twelve to fourteen inches in length. Babies are usually born in dens on snow-covered land between November and January and emerge in the spring. It is essential the mother eats plenty of food in the summer in order to build up sufficient fat before entering the den as she will have to live off the reserves. With polar bears maturing late, usually at four to five years, litters not being particularly large, and the first two to three years after birth being invested in parental care, the bears are unable to produce more than five litters in their lifetimes. This, of course, means a very low reproductive rate for the species. Cubs successfully surviving the current threats could live up to twenty-five years. Polar bears are known by various other names – a lot of other names! Nanuk, Lord of the Arctic, Ice Bear, Isbjorn and Tornassuk are just a few. Although primarily land dwellers, polar bears are considered marine rather than land mammals. As fissipeds, paw or pad-footed mammals, they belong with sea otters in the Order Carnivora. Others in the family include seals and walruses. Unlike many other bears, polar bears do not hibernate. Only pregnant females enter dens during winter. 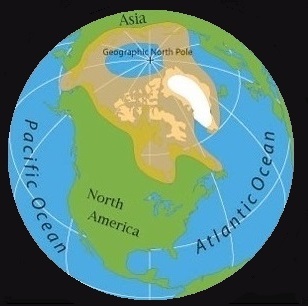 The Arctic ice regions surrounding the North Pole. Canada, Alaska, Greenland, Norway and the Russian Federation. Seals, primarily the ringed seal, and the odd walrus or beluga whale. They are also known to feed on the carcasses of the bowhead whale. Research indicates polar bears are now starting to adapt to a more land-based diet as the ice continues to melt. Climate change. Oil and gas development and oil spills, increased shipping traffic, pollution, drowning, over-harvesting for meat and skins by locals, and hunting for sport by other parties. The polar bear (Ursus maritimus) is listed on the IUCN Red List of Threatened Species as Vulnerable (at high risk of endangerment in the wild). It is also listed on CITES Appendix II. Polar bears are protected in the United States under the Marine Mammal Protection Act and listed under Section 4(d) of the Endangered Species Act as Threatened wherever found. There are an estimated twenty to twenty-five thousand polar bears left in the wild. These are split into nineteen reported sub-populations, the largest being in Canada. There are various captive breeding programmes currently in action and polar bears can be found in zoos across the world. Many agencies and individuals are working globally to reduce the current environmental issues which impact on the bears. If oil spills in the Arctic and no one is around to clean it up, does it just stay there? Don’t-care bears: should we be worried about polar bears? Annual polar bear migration underway: How climate change could be impacting it. Did Polar Bears Really Lose at CITES? How Much Would You Pay to Hand-Feed a Polar Bear – and Will It Save Them? The small and graceful Dorcas gazelle continuously falls prey to what is left of the indigenous four-legged occupants of North Africa and the Middle East. Natural hunters such as lion, caracal, Arabian wolves, cheetah and leopard. But, the efforts of all these predators combined are no match for humans and the havoc they have wreaked upon the species. Little surprise to most, of course, since this seems to be the prevailing cause of decline in ninety-eight per cent of all wildlife today. Although the Dorcas gazelle has long been, and still is, subjected to traditional hunting for meat, hides and horns, the killers have now upped the ante. Current, uncontrolled pursuance of the species in high-performance, four-wheel-drive vehicles, carrying trigger-happy assassins armed with powerful modern weaponry, is something which patently needs to be addressed by the hosting countries. Who, shamefully in some cases, issue permits for this barbaric enterprise. In most parts of its range, however, hunting the gazelle is deemed illegal, but it continues regardless and a blind eye is often turned by the authorities. And, just as often, groups of militia are among the bands of slayers. For those who see killing as an enjoyable past-time, the opportunity is but a phone call and a credit card away. There are plenty of blood-thirsty safaris, for the right price, where you will find everything laid on for you, right down to the freely available permits which can be bought at the airport upon landing. Horrendous mental images leap to mind of ruthless, like-minded men and women standing up in the back of open-topped, fast-moving, specially adapted motor vehicles. Their weapons (often automatic) loaded and ready to discharge as they rapidly gain on the animals, preparing to pick them off at will. The faces of the executioners aglow with anticipation – rather like those of innocent children waking up on Christmas morning. But the outcome here is far more sinister. Dorcas gazelle can travel up to sixty mph when threatened, and like all other gazelle, speed is this gentle ungulate’s only asset when defending itself. But in this case, the advantage of being fleet of foot is lost to the superior vehicles and their cold-blooded hunting parties. Within a short time whole herds are found, overtaken and massacred – the unfortunate victims of large scale slaughter for the entertainment of the few, in their eternal quest for amusement. Atop of that, the gazelle’s habitat is rapidly shrinking in the face of human invasion. In recent times, the development of wells and boreholes has seen an influx of humanity pouring into the desert, along with their livestock. That the clean water supplies have saved lives, there is no doubt. Both human and non-human animals have benefited greatly. But now, converted to farmland; cattle, goats and sheep graze the arid landscape where abundant Dorcas gazelle once roamed freely, slowly squeezing it out of its habitat. These activities have all influenced the decline of the Dorcas gazelle and have led to these delightful, placid creatures becoming extinct in several parts of Africa. Now is perhaps the time to ensure no further vulnerable populations are lost to human greed, callousness and oversight. The irony being, they are now marginally safer from their natural predators as most of them, too, have been aggressively hunted down and killed for meat, hides, body parts and recreation. These diminutive, perfectly assembled creatures are little more than two feet in height and weigh, at most, forty-five pounds. They sport ringed horns which curl backwards and inwards, and grow up to fifteen inches in length. The female horns tend to be thinner, paler and not quite as curved. Their coats are a palish sandy colour on top with a deeper colouring of two differing brown strips along the edge of the underside where the coat becomes white. Heads are darker than bodies with well-defined facial markings. They have short, almost black tails used constantly for flicking away insects in the intense heat of the desert. And, they absolutely thrive in the desert. They are able to withstand extreme temperatures in their far from hospitable, parched environment, and manage to derive all the moisture they need from the plants they consume. But survival is not just about food and water. The Dorcas gazelle still has a few natural predators left, like the caracal and hyena, and the Arabian wolf, and perfect eyesight allows them to efficiently watch out for such dangers and call to each other when anything fearful is spotted. “Stotting” takes place, which involves taking bouncing leaps with heads held high, along with shivering and tail twitching, which are all are used to warn the rest of the herd when something is amiss. At such times, calves are kept well-hidden from potential harm. Newborns, arriving after a gestation period of six months, are usually well-developed and able to stand within the first hour, but not able to defend themselves or run with the herd, so a secure hiding place is a must. The females, having separated from the group to give birth to the new calf, will stash the little one in the bushes or long grass for the first few weeks of its life, which also leaves her free to graze. The calf will be strong enough at two weeks to follow its mother in short bouts, and by three months it will be fully weaned. Those who survive the rigours of life in the wild can expect to live for a further twelve years. 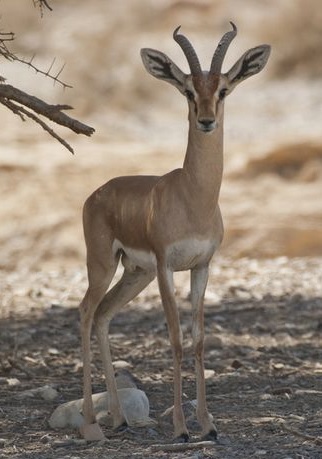 The Dorcas gazelle, along with a few other ungulates, is extremely important as a seed disperser for a variety of Acacia plants in the areas between Israel and the Red Sea. The Dorcas gazelle once roamed the entire Sahelo-Saharan region in great numbers. The species is now extinct in Senegal, possibly Nigeria and, it is thought, Burkina Faso as well. Dorcas is the Greek translation of the Aramaic name Tabitha, meaning “gazelle”. Dorcas gazelle are also known as the Ariel gazelle. Savannah, low hilly outcrops, semi-desert, absolute desert, steppe and wadis (dry gullies). Leaves, grasses, flowers, young shoots, fruits and acacia pods. Excessive recreational hunting with powerful modern weaponry. Habitat degradation due to land conversion and overgrazing by livestock, and drought. The Dorcas gazelle (Gazella dorcas) is listed on the IUCN Red List of Threatened Species as Vulnerable (at high risk of endangerment in the wild). It is also listed in CITES Appendix III (Algeria, Tunisia) and included in the Convention on the Conservation of Migratory Species of Wild Animals (CMS) Sahelo-Saharan Antelopes Action plan for the conservation and restoration of the species, on CMS Appendix I. All told, the species is either legally or partially protected in most if its range countries. Some of these include designated reserves. Unfortunately, these laws are often ignored. Captive breeding programmes also exist. There are only some 35,000 – 40,000 Dorcas gazelle living in fragmented populations in the wild today, whose numbers are declining rapidly. Further animals can be found in zoos and private collections around the world. By the early part of the twentieth century, huge numbers of Przewalski’s foals had been captured by exotic animal traders, the most going to a German merchant named Carl Hagenbeck. They were shipped to Asian and European zoos and private collectors. The horse had been described by Colonel Nikolai Mikhaylovich Przewalski, a Russian geographer, only twenty years earlier. Once word was out, they all wanted one. Carl Hagenbeck, almost single-handedly, managed to decimate most of the herds of the world’s only extant species of truly wild horse. Although Przewalski’s horse had been over-hunted for centuries, the species had never before experienced this sort of devastation. Very few foals survived capture and the arduous journeys they were forced to make. And the methods for capture and transportation were truly heart-breaking. Mongolian tribesmen were employed to capture the horses. Upon realisation that the adult horses were too fast for them, the tribal horsemen were instructed to target the foals. These foals needed to be very young for the plan to succeed. Fast horses were used to chase the herds. The chase soon became too much for the foals, who then failed to keep up with their elders. If resistance was shown by any adult horses who turned back to defend the foals, they would be killed or dispersed. Fresh horses would then be used to round up the exhausted foals, most of which were not yet weaned. The foals were then hog-tied and put in sacks over camels for the first stage of transportation. Once captive, the young foals were fed sheep’s milk, which resulted in a high rate of mortality. The captors then rethought their plan and used domestic mares, whose own foals had been taken from them, to feed the next batch of foals they captured. This appeared to be effective and the foals are mares were made ready for further transportation. The prolonged trip the young foals faced was horrendous. Moved to Kobdo on foot they would then, after a short rest, be tied to their newly-adopted mothers and forced to travel over three hundred miles on foot to Bysk. From there they travelled by train across Siberia to Europe. Depending on their destination, some were then placed on boats and kept in the hold with the cargo. From initial capture to final destination, these trips lasted eight or nine months. Most of the foals died en route. The scattered remaining herds left roaming the steppes of Asia and Europe fell victim to human settlement, cultivation and competition for grazing and water with domestic livestock. Further deprived of both food and water by nomadic tribesmen, they were gradually driven further away from their natural habitat. Then conflict between Russia and China in the 1950s saw militia groups slaughtering herds, en masse, for meat for their troops. Added to that atrocity, during World War II, German soldiers obliterated an entire Ukrainian herd – the most viable of all the remaining herds. By now the animals were desperately struggling for survival. Furthermore, climatic change brought about some harsh winters in the mid-twentieth century and many horses were simply unable to survive such severe weather conditions. In 1967, an expedition from the Mongolian University found five living animals in the Altai Mountains. The following year a mare with a foal, a single stallion and two young horses were discovered in different locations within the same area. No further Przewalski’s horses were ever seen in the wild again. After over twenty thousand years, an entire species had been eradicated. Unconfirmed reports suggest a few individuals were roaming in isolated areas, but they too soon disappeared. A further unconfirmed report suggests the last wild Przewalski’s horses were seen drinking from a spring in the Dzungarian Gobi Desert in 1980. These reports were thought too improbable to be credible and dismissed, and Przewalski’s horse was considered, by most authorities, to be extinct in the wild. At this point in time, approximately two hundred and fifty Przewalski’s horses could be found in fifty zoos and private collections across the world. Although the species has continued to survive in zoos, conditions have been far from ideal. Apart from the obvious lack of vast spaces, as the The Foundation for the Preservation and Protection of the Przewalski Horse so rightly points out, enclosures were often too small and adequately grassed areas were not provided. Lack of regulation involved in keeping wild animals in captivity abounded in the 1980’s, which, quite frankly, was not that long ago. These and other animals were swopped haphazardly between zoos and other establishments without any regard to inbreeding and genetic diseases. This species, and others, suffered considerably because of lack of policy. But the story of Przewalski’s horse is no longer one of gloom and despair. Though not all captive breeding programmes are what they seem, and many are simply a cover for commercially orientated, profit-making organisations, The Foundation for the Preservation and Protection of the Przewalski Horse provides a heart-warming story of success. This genuine organisation was founded with only the interests of the species at heart. Moved by the animal’s demise in the wild, the founders, the late Jan Bouman and Inge Bouman, were determined to assist the recovery of these majestic wild creatures. The Foundation also established a computerised stud book to halt inbreeding by committing to increased exchanges of stock between zoos throughout the world. The Foundation even started advising zoos on breeding Przewalski horses. At that point, the stock offered by many zoos was far too diluted to be useful; through necessity, selection needed to be approached with extreme care and zoo policies changed dramatically. With the financial support of the Netherlands’ branch of the WWF, the Foundation was later able to buy non-related stock from a number of zoos. The descendants of animals originally taken as exhibits were now unknowingly participating in a programme to bring their own species back to its natural environment. The Foundation’s own breeding programme was set up, with care being taken to ensure maximum genetic diversity. Nature reserves (semi-reserves) were established, which provided semi-wild living conditions. A sort of halfway house for horses. After having lived in zoos for many years, Przewalski horses needed to learn to find their own food and to live in natural groups, acclimatising them before shipment. Foals were born within the semi-reserves adding to the stock. Small herds were put together, each consisting of one stallion and a small harem of mares. Fifteen years after the Foundation was born, the first Przewalski’s horses were carefully and lovingly flown home to Mongolia. Here they were further acclimatised, within specific holding areas, to the weather conditions, new vegetation and natural herd living; learning how to live as wild horses before being set completely free in the park. An appropriate part of Mongolia had already been chosen in which to release them – the Hustai (Khustain Nuruu) National Park, a beautiful steppe area rich in flora and fauna and having natural water springs. Two years later the horses were finally set free into the steppe. Sixteen horses were transported and released thus every two years from 1992 to 2002. Thirteen groups eventually roamed the steppe. A remarkable and inspiring achievement born of the dedication and perseverance of two individual people who cared enough to travel a road fraught with problems and obstacles, but who refused to give up, making them alone responsible for saving this species. Since then, various other organisations and zoos have helped to return other captive Przewalski’s horses to their natural habitat. Though numbers are still not large enough to remove it from endangered status, the species is thriving once more in the wild. And, because of the Foundation’s dedicated efforts, Przewalski’s horse numbers across the world have risen significantly. Sadly, Przewalski’s horse still faces threats in the wild. The greatest being hybridisation with domestic stock and infectious diseases transmitted by domestic horses. Much care is, of course, being taken to prevent this within the protected areas, but things do happen. Wolves are known to prey on foals and have contributed to a notable number of deaths. Competition for food and water continues to remain a problem as do the more recently established illegal mining activities in the Hustai National Park. But, despite all that, the future for these now firmly re-established, magnificent, wild herds looks extremely promising. Przewalski’s horses are stocky animals with stallions weighing up to six hundred and sixty pounds and reaching a height, at the withers, of just under fourteen hands (four feet eight inches) and a length of seven feet. Mares are just slightly smaller. Both sexes have short, thick necks topped with a mane consisting of short stand-up hairs, making them looked as though they have been hogged. An unusual trait is the annual shedding of this mane; and further, the absence of a forelock. Dense coats vary in colour from a yellowish-russet to a pale greyish-beige. All Przewalski’s horses have a light underside with a darker back, head and neck, and dark legs. A long, dark, stripe runs down the back from the withers to the base of the tail. Heads sport white muzzles with black markings around the nostrils and dark rings around the ears. Eyes can be blue or brown. In the wild, Przewalski’s horses live in two kinds of social groups: harem groups and bachelor groups. Bachelor groups consist of young horses, as yet without a harem of their own, but old enough to be a threat to the leader of their natal group, and older horses past their prime who have acquiesced to the stronger male and gone it alone. Harem groups are small, family groups led by one dominant stallion, and usually consist of ten mares at most and their offspring. When young stallions are mature enough, they will form harems of their own. Once relationships are established, the mares will stay with the stallion indefinitely. He, in turn, will assume the role of family/harem defender at all times. Females are capable of reproducing until they are twenty years of age and males to thirty years. Mares are old enough to reproduce at between two and four years of age. There is an eleven-month ( 320-343 days) gestation period. Mares ready to foal will leave the group to seek a quiet place to give birth to a single foal (twins are highly unusual) weighing almost seventy pounds. On its first day on earth the foal will stand, within thirty minutes, walk, trot a little and play. Little neighing sounds can also be heard. Within a week it will be eating grass. The foal will stay within the natal group until it is old enough itself to breed. Contact between the horses is maintained visually, and communication includes a range of vocalisations and tactile movements, such as grooming, nibbling and kicking. Przewalski’s horse is the only living wild horse. Other “wild” horses such as the Brumby or Mustang are feral animals descended from domestic stock which has reverted to the wild. Przewalski’s horse once roamed freely across central Asia, China, and western Europe. Prehistoric cave paintings can be seen in France and Spain depicting the horse. Although there have been attempts, Przewalski’s horse, pronounced “shuh-vaal-skee’, has never been successfully domesticated. All Przewalski’s horses alive today are descended from thirteen horses captured at the beginning of the twentieth century. Przewalski’s horse is also known as the Asian wild horse or Mongolian wild horse. The native Mongolians call it “takh” or Takhi” – the spirit horse. Steppe, semi-desert shrubland and plains. Originally re-introduced into Mongolia, herds can now be found in protected areas in southern Russia, Hungary and the Gobi Desert in China. An independent herd also exists within the Chernobyl exclusion zone. Hybridisation and competition for natural resources with domestic horses. Illegal mining within Hustai National Park. Disease. Foal predation by wolves. Przewalski’s horse (Equus ferus ssp. przewalskii) is listed on the IUCN Red List of Threatened Species as Endangered. It is also safeguarded under CITES Appendix I (as Equus przewalskii). It is legally protected in Mongolia where hunting has been prohibited since 1930. Having been declared extinct in the wild by most authorities in the late 1960’s, the species was later re-introduced into Mongolia, within the confines of Hustai (Khustain Nuruu) National Park, in 1992. It was classified as Critically Endangered by the IUCN in 2008 and subsequently re-classified as Endangered in 2011. Over time, populations have reached other reserves and numbers have increased. Przewalski’s horse has been the subject of various successful captive breeding programmes, specifically that of The Foundation for the Preservation and Protection of the Przewalski Horse, whose mission focused entirely on the eventual re-introduction of the species to the wild. I always think of the mythical Phoenix when I see this beautiful and critically endangered bird. Not in as much as its story has any real bearing on the bird of the mythologies of the ancient Egyptians, Greeks, Romans, et cetera – though it would be marvellous if numbers could rise anew from the kaingin ashes – but because its stunning, elongated crest feathers, resembling a war-like headdress, its huge wings and its long tail more-or-less fulfil my visual expectations of the legendary, sacred firebird. But the majestic Philippine eagle is far from mythical, although in some parts it may seem so. Formerly known as the monkey-eating eagle, it was once abundant in the Philippines. Now it exists on only four of the Philippine islands: Luzon in the north, Mindanao in the south (where most of the birds are found) and Leyte in the Eastern Visayas. A recent rare sighting has also been made on Samar, again in the Eastern Visayas, bringing fresh hope to the islanders who had thought the species to be all but extirpated in their locality. It is easy to see why the Filipinos are so proud of the eagle. This impressive raptor is one of the world’s largest birds of prey. Its seven-foot wingspan and long tail serve it well as a skilful hunter; swooping low with great agility and speed, and manoeuvring gracefully through the dense, tangled foliage of the rainforest. Civets and flying lemurs (which are not true lemurs, incidentally – those are only found in Madagascar) are its first choice of prey, and they are able to catch these with consummate ease. Unfortunately, such skills are no longer used as much as they were, since their prey, along with their habitat, is fast disappearing and they are struggling to survive. Vast tracts of tropical forest on the islands have been cleared and any further forest loss within their range must be prevented if the species is to have any future. Incessant, needless deforestation by commercial logging, agriculture, settlement and open-pit mining has hastened the Philippine eagle along the path of extinction. Over ninety percent of its forest habitat has already been destroyed, hampering its chances of survival and making it the most exploited and most endangered avian species on earth. The Philippine eagle has been aggressively hunted for food, shot as trophies and persecuted by local farmers in the belief their chickens are vulnerable to capture. Juveniles have been poached for zoos and other illegal wildlife trade markets, catering for private and public greed and display. Precious eggs have been stolen and sold for a high price on the black market. And to add to all that, the uncontrolled and widespread use of pesticides has brought about further fatalities amongst the populations and may have had an effect on reproductive output, which, at best, is extremely slow. And let’s not forget the series of cataclysmic floods and mud slides which have occurred over the past few decades, and which have affected both human and non-human species. Whether or not such ‘natural’ disasters can be totally attributed to deforestation and mining in the islands is debatable. But clearly such actions have contributed enormously to the catastrophic effect, and the environment and its biodiversity has been irretrievably altered by them. That is not to say, help is not being given. A great many Filipinos are working hard to prevent the loss of their eagle. These birds are endemic to the Philippines and are part of the nation’s cultural heritage. Conservation plans to protect the eagles are already in place and laws have been passed prohibiting hunting and protecting nests. Awareness is being raised and educational lectures are being given by the Philippine Eagle Foundation, in the Philippine Eagle Center in Davao City, Mindanao, to all visitors. Whereas killing a Philippine eagle carries a relatively severe punishment, deaths are still occurring. Several captive eagles, which had been released back into the wild, have regrettably been found dead. Some had been shot, and, in one case, the cause of death unknown, only the feet were found buried in the ground. Sadly, the magnificent Philippine eagle is a very easy target for malefactors. Weighing anything up to eighteen pounds, being well over three feet long and having a wingspan of between six and seven feet, this is one very large and conspicuous bird. The crown and crest of the bird is a pale caramelly-brown with black flashes. The large bill is blue to grey. The top of the body is covered with long, deep-brown feathers with pale tips and the undersides and chest are creamy-white. The tail is brown with darker bars and a white edge, and the feet are heavy and noticeably yellow. Needless to say, it has extremely powerful talons, perfectly adapted to its own hunting techniques. Hunting in pairs, they operate as a duo. One bird will act as a decoy, while the other swoops in to attack. They are, in fact, opportunists and will often prey upon whatever they see first, although they do prefer prey living high in the trees, and the double-act can work well when spotting a group of monkeys. Pairs seem to be a bit of thing for these birds. They are monogamous and will pair for life. Unless one dies, in which case the surviving eagle will find another mate. These pairs will nest once every two years. The breeding season is very much dependent on the location. When the time for egg laying approaches, the female becomes sickly and refuses food. This can last for up to ten days. At the same time she will drink a lot of water and make a lot of loud calls. Her wings become droopy and she begins to look altogether rather seedy. The name for this condition is “egg lethargy”. At this point nest-building begins. A single egg will be laid in the finished nest. There is an incubation period of up to sixty-eight days. Both parents will help with the incubation of the egg, but the female will take most of the day-time shift. Following successful incubation, the newly hatched chick will remain in the nest for up to five and a half months before taking its first flight. It will not leave its parents at this point, and will remain in their care for a further twelve months. From the time the pair first come together to the time the juveniles leave the parental territory, a period of two years will have lapsed. This illustrates further the problems these eagles are facing in trying to replenish their numbers in the wild. Sadly, there is also a very high mortality rate amongst young chicks, but for those who do survive, a long life can be expected. Philippine eagles have been recorded as living up to forty-one years in captivity, though, as with other species, their life expectancy in the wild will be less. John Whitehead, a British naturalist and explorer, was the first person to collect a specimen of the bird whilst visiting the island of Samar in 1896. After being told by the locals of Samar its diet consisted exclusively of monkeys, he named it first “Pithecophaga”, derived from the Greek “pithecus” meaning ape or monkey and “phagus” meaning eater of. The second name he chose, “jefferyi”, was in honour of his father who had backed all his expeditions. For decades Pithecophaga jefferyi continued to be commonly known as the monkey-eating eagle. In 1978, during the “Marcos Dynasty”, a presidential proclamation declared by President Ferdinand E. Marcos renamed it the Philippine eagle. In 1995, a further proclamation was issued by President Fidel V. Ramos declaring the Philippine eagle the national bird, automatically replacing its predecessor, the maya. Remnant patches of mountainous and lowland forest. The islands of Luzon, Samar, Leyte and Mindanao. The majority can be found on the island of Mindanao. Flying lemurs, palm civets, flying squirrels, snakes, rats, monkeys and other such small to medium mammals. Forest destruction and fragmentation, through commercial logging. Mining, more specifically, open-pit mining. Uncontrolled hunting for subsistence food. Capture for zoos and wildlife trade, and accidental capture. Pollution by pesticides is also playing a large role in the decline of the species, and occasionally, electrocution. A slow reproductive cycle is hindering any thoughts of rapid re-population. The Philippine eagle (Pithecophaga jefferyi) is listed on the IUCN Red List of Threatened Species as Critically Endangered. It is also listed on CITES Appendices I and II. In the Philippines, the species is protected by law. Killing a Philippine eagle carries a twelve year prison sentence. There are thought to be less than five hundred individuals left in the wild. A major captive breeding programme conducted by the Philippine Eagle Foundation exists at the Philippine Eagle Center in Malagos, where currently thirty-six Philippine eagles are housed, half of which have been bred in the centre. In this centre, positive efforts are made to return the eagles to the wild. Various protected areas exist throughout the species’ restricted range. How sad it would be to lose the unique Grévy’s zebra from the plains of Africa. It is the rarest and most endangered of all species of zebra, and no other African mammal has seen such dramatic reductions in range as Grévy’s zebra has in recent decades. Being driven from its home by pastoral farmers after being forced to compete with cattle and goats for food and water has been one of the major problems the animals have had to face. Over-grazing has left the land severely degraded. Furthermore, irrigation schemes surrounding the Ewaso Ng’iro River have seriously depleted water supplies in the past thirty years, “reducing dry season river flow by 90%” (Williams 2002). This and natural droughts have been significant contributory factors in, not only the deaths of adults, but also the high rate of juvenile mortality (fifty per cent), posing a huge threat to the species. Human disturbance at crucial watering holes is also hastening their decline. Grévy’s zebra are able to live without water for up to five days, but this is their limit and access is then necessary. The distances they are compelled to travel between food and accessible water often prove too much for the foals and many die en route. Diseases occur, and an outbreak of anthrax between December 2005 and March 2006 killed more than fifty Grévy’s zebra in the Wamba area of Rift Valley Province in central Kenya. Considering their low numbers, this constituted quite a high percentage of the population. In the late 1970s, zebra were extensively hunted for their highly prized skins, medicinal value and subsistence food, which markedly added to the initial reduction in numbers. Since then, hunting has been outlawed, but still persists in some areas; notably in Ethiopia where the laws are not always adhered to. Here the isolated populations are still sought primarily for their hides, occasionally for food and sporadically in connection with traditional healing. But now much has changed for Grévy’s zebra, and the outlook is beginning to look a little more promising. But their numbers are still few and they may well become extinct in the wild if conservation plans are not successful. So what is being done! Currently, there are some amazing ongoing projects in existence run by various NGO, including the Grévy’s Zebra Trust, which are doing their utmost to save the species within its own or similar habitat. This includes involving the local tribes of Kenya. Fourteen years ago, Grévy’s zebra became a conservation flagship species among the pastoral communities of northern Kenya. At this point, indigenous tribes began to take a pride in their wildlife and ceased to be huntsmen and became guardians instead. This was an extraordinary turning point, beneficial to both wildlife and local farmers. Not forgetting, the zebra has its fair share of natural predators, too. The Kenya Wildlife Service, the Lewa Wildlife Conservancy and the Ol Pejeta Wildlife Conservancy initiated a plan in 2012 to translocate the Grévy’s zebras, currently distributed thinly across the Ol Pejeta Conservancy,to a predator-free fenced area of seven thousand and four hundred acres. Several are now living safely in this area. Since lion, leopard, cheetah, etc, take a fairly substantial share of beasts, this too is a heartening step towards enhancing the populations. And, of course, these predators will still have plenty of other natural prey left on their own home ground to choose from. Separating the Grévy’s zebra from the plains zebra, will also eliminate any further problems of hybridisation which have already occurred. Grévy’s zebra are ridiculously easy to spot out on the plains. They have huge furry ears, large heads and long legs. They are the largest of all wild equids and their stripes are as unique as the human fingerprint. Unlike the plains zebra, who is closely related to the horse, Grévy’s zebra,between its habits and distribution, falls somewhere between the wild asses and other zebras. Although they have the classic black zebra stripes which form a concentric pattern, in Grévy’s zebra these are notably narrower than those of other species. Foals are born with reddish-brown stripes which darken with maturity. Each adult animal has a characteristic dorsal stripe, black with white either side, and a very discernible brown muzzle. The hogged-like mane and forelock hairs have brown tips, as does the tail, and the underside is gleaming white. As far as build goes, Grévy’s zebra are fairly solid animals weighing up to nine hundred pounds. They can be as much as nine feet long and stand almost five and a half feet at the shoulder. Generally speaking, males tend to be about ten per cent larger than females. They are herd animals, but where there is dominance over breeding females by the leading males, there is rarely aggression. Some males are highly territorial where others are not. Those who are claim prime watering and grazing rights. They are also solitary, except for mating, and will often remain in their territories during the dry season, whilst other migrate to lusher pastures. The non-territorial males travel together in small bachelor groups of up to eight individuals. Socially, Grévy’s zebra do not form stable social units, or harems, such as other species of zebra do. Their social structure consists mainly of females attached to their young and joining large herds of other females and their offspring, and males being attached to their territory or forming bachelor groups. Females are polyandrous and, during the breeding season (they breed once every two years), are capable of visiting up to four territories a day in search of partners. The breeding season takes place in August and September, with births coinciding with the early rains. There is an exceptionally long gestation period of three hundred and ninety days, after which a single foal, weighing eighty to ninety pounds, will be born. Newborn foals are like newborn ducklings; they will attach themselves to the first thing they see. New mothers instantly protect their young from other approaching mares until they have imprinted their own stripes, scent and sounds on the newborns. The new foal will be able to stand after just six minutes, and run after forty only minutes. It will not be weaned until six to eight months of age and may continue to travel with its mother for the next three years. Unfortunately, when very young and left alone in the open whilst their mothers forage for food, foals have a tendency to stand still rather than run away from predators. This is, of course, fatal. In 1882, the Emperor of Abyssinia (Ethiopia), Menelik II, thought these zebras were rather regal-looking, and as such he gifted one of them to Jules Grévy, the then President of France. The zebra was subsequently accorded its own species and named after him. Over six hundred Grévy’s zebra are recorded as living in zoos across the world, many in captive breeding programmes where they have bred very successfully, but I have been unable to find any evidence of any of these institutions taking steps to return the animals to the wild. Most seem to be simply kept as tourist attractions. As usual, comments are most welcome. Arid and semi-arid grass and shrubland, and dry acacia savannah; all within range of permanent water. Northern Kenya and southern and eastern Ethiopia. Grasses and forbs, and leaves in the dry season. Habitat loss through over-grazing, competition for food and water, drought, hybridisation, disease and illegal hunting for meat, hides and Traditional medicine. Natural predators include lion, hyena, leopard and cheetah. Grévy’s zebra (Equus grevyi) is listed on the IUCN Red List of Threatened Species as Endangered. It is also listed on CITES Appendix I. Although the population is thought to be stable, only two and a half thousand or so remain with over six hundred of the species being kept in captivity. The Lewa Wildlife Conservancy in Kenya holds three hundred and seventy individuals constituting fifteen per cent of the entire population. The species is protected by law in Ethiopia. In Kenya, where ninety per cent of the populations live, hunting has been banned since 1977 and Grévy’s zebra is being elevated from ‘Game Animal’ to ‘Protected Animal’. Conservation projects exist in both countries focusing on better management of protected areas, protection of water supplies, community involvement and monitoring of wild population numbers. Here are just a few worthwhile and informative articles about the current status and conservation efforts on behalf of Grévy’s zebra. S outhern pudús are the smallest deer in existence. Their size, coupled with their endearing appearance, has made them targets for the illegal exotic pet market. Many have been taken from the wild as babies to satisfy the whims of uncaring and mindless consumers, oblivious to all but their own desires. Pudú are also snatched from the wild and shipped off to various zoos around the world, presumably to aid the survival of the species! But their plight doesn’t end there. Specialist trained dogs are used to hunt them down. The pudús are then fed to the dogs as part of their diet. Dogs, incidentally, which also transmit diseases to the deer. And, in keeping with the age-old threats to most wildlife, the adorable pudús are poached for food and hunted for sport. I think it goes without saying man has virtually destroyed their habitat, leaving them living in fragmented areas. When travelling between locations, they now come across roads built for settlements, ranches and plantations. They are not particularly good at negotiating these, especially with fast traffic, and road deaths are high among the pudú populations. And, if all that were not enough, populations of red deer have been introduced to their home territory. Between the larger deer and the cattle from the ranches, the poor little pudús are now having to compete for food as well. That’s an awful lot of problems for something little more than a foot high. In fact, pudús normally reach a height of about fifteen inches and typically weigh twenty pounds, so they are something akin to the size of an average family dog. They have small eyes and ears and short tails. Adult coats are reddish-brown in colour with fawns’ coats bearing white spots, possibly for camouflage, until they reach maturity. Males sport short antlers which are shed annually. In the wild, southern pudús, also known as Chilean pudús, are nocturnal and crepuscular. They forage in the dense undergrowth and bamboo thickets seeking out fresh vegetation and fallen fruit, and balancing on their hind legs to reach fresh leaves on the trees. Physically, they excel at sprinting and climbing. If pudús sense danger, they bark and run in a rapid zig-zag manner to elude or outrun any predators. Pudús tend to live alone or in pairs, and very occasionally in groups of three. Individuals come together during the rut which takes place in April and May. A gestation period of about seven months follows, after which a single fawn will be born. Fawns are tiny, weighing less than thirty ounces, and are on their feet almost immediately. Care of the young falls entirely to the mother. Pudús advance quickly and are usually weaned by two months. Females will be mature at six months of age and males at eight to twelve months. Dense temperate forest or bamboo groves. Their varied diet includes leaves, shoots, fruit, bark, seeds and berries. Poaching and illegal taking for zoos, private collections and the exotic pet trade. Pudú are killed for sport and food using specifically trained domestic hunting dogs. Habitat loss due to cattle ranching, logging and other human developments. Road accidents. Diseases transferred by domestic dogs. Competition for food from the introduced red deer. The pudú’s natural predators include eagle owls, cougar, fox and small cats such as the kodkod. The Chilean pudú (Pudú puda) is listed on the IUCN Red List of Threatened Species as Vulnerable (high risk of endangerment in the wild). It is also listed on Appendix I of CITES. Southern pudús have been bred successfully in several zoos across the world and international captive breeding programmes have been developed for the species. Although, the only evidence I can find of any being returned to the wild are the few that exist in the Nahuel Huapi National Park in Argentina. Others appear to have been kept simply as exhibits in zoos. Any further information would be welcome. Please feel free to leave a comment. The Zemanta related articles provided below are all centred on zoo births, as is the video. Whereas I feel ill-inclined to support these profit-making organisations by referring to them on this blog, the events themselves are joyous occasions from respected sources, so I have included them here. Let’s just hope these little animals grow to live full and happy lives. Domestic Dogs in Rural Communities around Protected Areas: Conservation Problem or Conflict Solution?